Ocean racing is just about to become more colorful – again! The new ORR rules are allowing bloopers on non-sprit boats (with some restrictions). 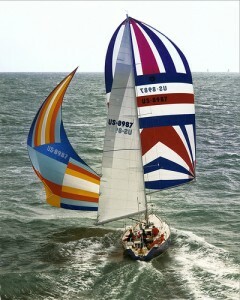 For sailors who don’t remember, look at the picture, and check out the big sail tacked to the port bow. Look at the wake, and the waves, and realize just how deep and fast they’re sailing. Pole back a bit, ease the main a bit, and trim on the the blooper and that boat is still launched – even dead down wind. In light and moderate air, you’ve got a big downwind sail you trim with the halyard. You’ll want a racing crew with someone who either has or can develop a different set of trimming skill, but you’ll make up for it with VMG and boat speed. That blooper helps narrow the gap between an older boat and the sprit boats. We’ll see them this year on the ocean races such as Bermuda, Transpac and Mackinac. 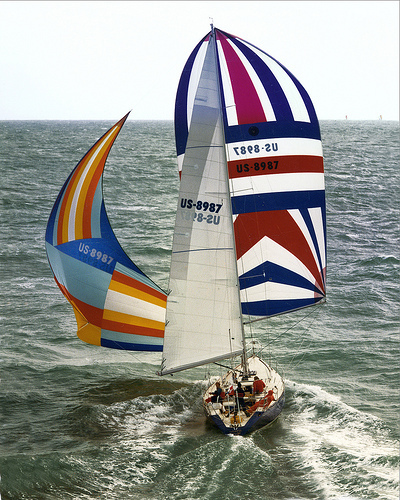 The ORR rule limits blooper use by treating the blooper as headsail (no pole), and within the number of sails the boat is allowed to carry. It has to be attached to the bow, and there are restraints on the boats allowed to fly them, as in basic design from before 1986. And couple of cautions: Think oscillations. Think about a little too much breeze and an interesting round up or crash jibe. On the other hand, think speed. Mike Dwight March 17, 2016 Category: Forespar Products in Use, General Content, Uncategorized. Tagged: blooper, sails, spinnaker pole.